Fortunately there is a much cheaper option. 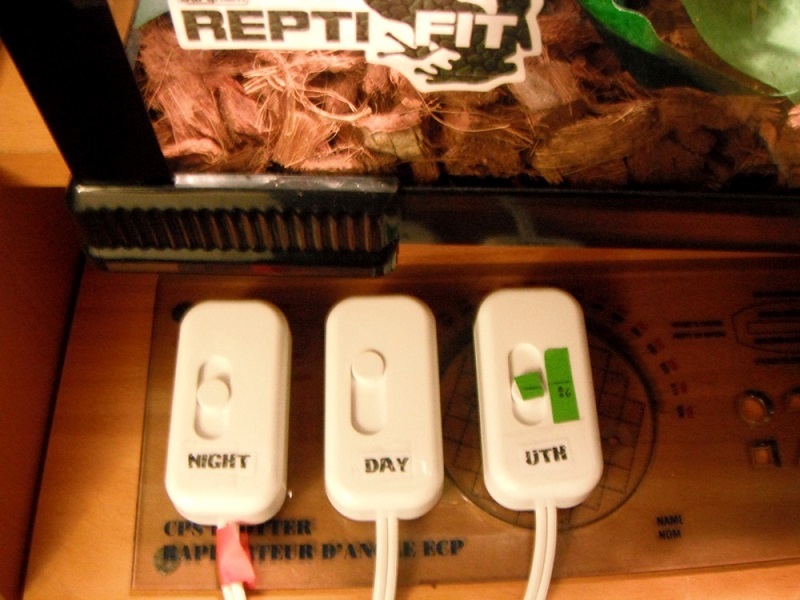 Rheostats (dimmer switches) have been used to good effect for many decades in the herpetocultural hobby. 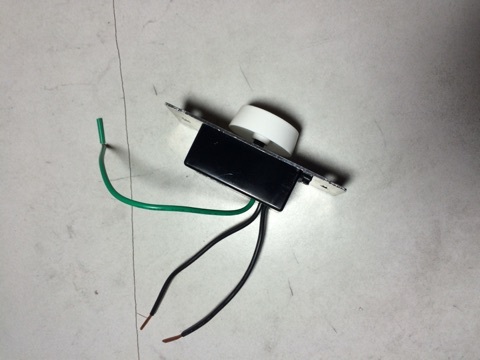 Long before small thermostats were even available, people were making their own heating regulators using a few cheap parts you can pick up at any home supply or hardware store. A thermostat is a smart device that will keep a constant temperature by regulating the amount of electricity going to your heating device by contantly checking the temperatures being sensed by a remote probe. When the probe registers a temperature that is lower then the set point of the thermostat, the thermostat turns on the electicity to the heating device which warms up the cage, when the probe registers the higher temperature, the thermostat shuts off the power to the heating device. Modern thermostats send electical pulses to your heating device many times per second which will keep the temperatures in the cage very stable. A rheostat on the other hand is a dumb device that doesn't care about temperatures. It regulates the amount of electricity going to your heating device according to where the knob on the dial is set. It has to be manually adjusted up or down. Turn the knob higher to get warmer temps or lower to get cooler temps, it will not adjust itself according to the temperature in the cage. If the room temperature goes up a few degrees, the cage temperature goes up a few degrees, if the temperature drops in the room then the temperature in the cage will drop too. You have to be much more vigilant in checking your own temperatures and manually adjusting the dimmer switch. With a thermostat you can pretty much set it and forget it while a dimmer switch is much more labor intensive. However, despite it's drawbacks, dimmer switches can be quite effective in regulating the temperatures in your cage especially if you check temps often and have the cage in a room that is not prone to large temperature swings. It SURE beats bringing your reptile to a vet to treat a burned belly caused by an unregulated heating device. Start by assembling your supplies, I picked these up at home depot. 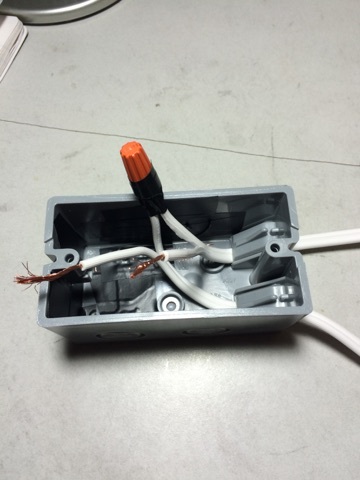 Cut your extension cord and split the wires a few inches and strip about 5/8" of insulation from the ends. I like to keep the female end close to the dimmer switch box and leave the male end long so I'll cut about 9"-12" back from the female end. 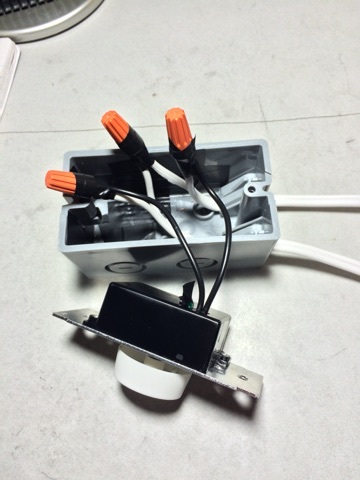 Feed the cut ends of both cords into the plastic utility box. Give yourself enough wire to work with but not so much that you end up stuffing a lot of it back in the box when you've finished. You'll notice that the electric utility box has a number of punch out plugs to feed the wire through. Use the smallest ones available, you don't want your box full of holes that are open to the outside. Your dimmer switch will have three wires coming out of it, the green one is the ground wire which we won't be using since our extension cord doesn't have a ground wire. I generally just cut it off. 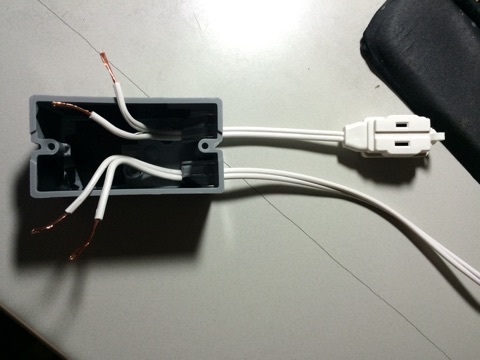 When wiring your dimmer switch, you'll want to wire the two wires coming out of the dimmer to only one side of the extension cord, it doesn't really matter which side as long as it's the same side (I generally choose the ribbed side). 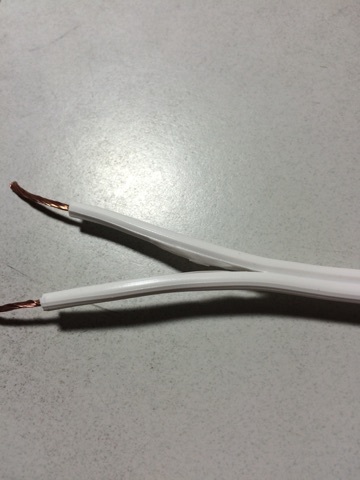 I will twist the ends of the two smooth wire sides together, screw on a wire nut and wrap in electrical tape. 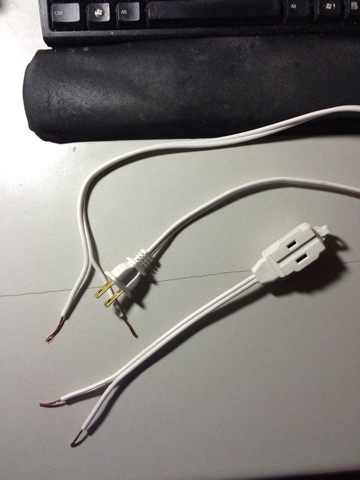 Then I will twist together one of the wires coming from the dimmer switch to the wire on the ribbed side of the extension cord going to the female end and the other wire coming from the dimmer switch to the ribbed side of the cord going to the male end of the extension cord. Screw on some wire nuts to hold the wires together and wrap in electrical tape. Stuff all of the wires back into the utility box. 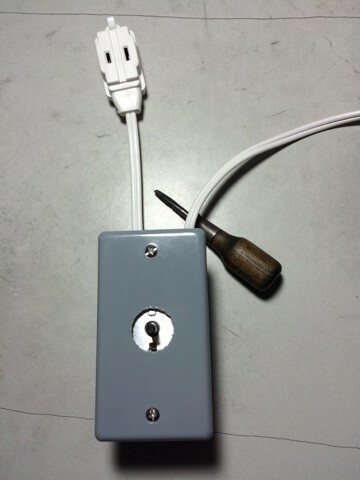 Remove the knob from the dimmer switch, punch or drill out the plug in the middle of the face plate and then screw the faceplate onto the utility box. 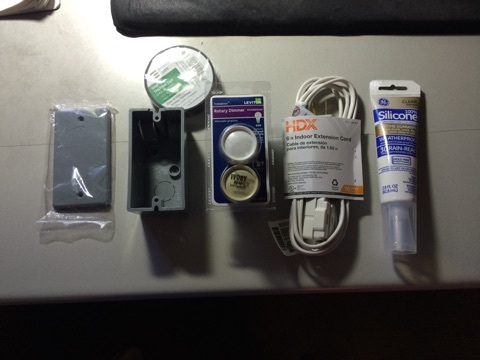 Push the knob back onto the pole of the dimmer switch and you're pretty much done. As an optional step, I like to fill all of the holes and cracks with silicone. I can get kind of sloppy with the water when I'm cleaning so I like to make it as water tight as possible. I know it's really not all THAT water tight but every little bit helps. 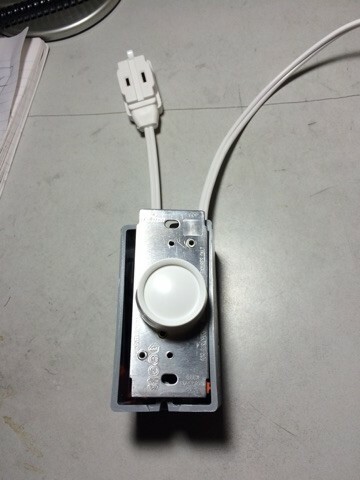 And here is your completed dimmer switch. 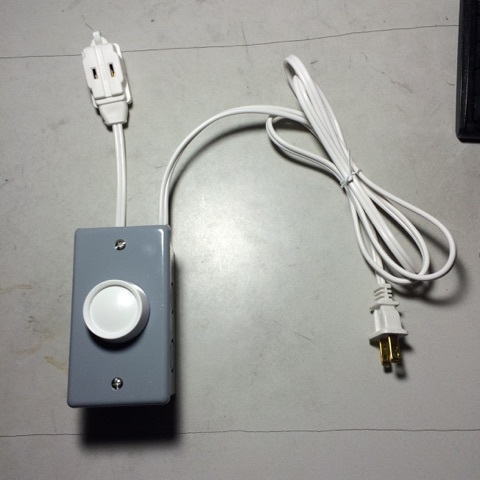 Plug the male end into the wall and plug your heating device into the female end and you can use this to regulate the temperatures in your cage. It's a good idea to get an indoor/outdoor digital thermometer and attach the outdoor probe to your heating pad, then you can raise or lower the heat by adjusting the amount of electricity going to it with the dimmer switch. Last edited by MarkS; 12-31-2014 at 11:59 AM. 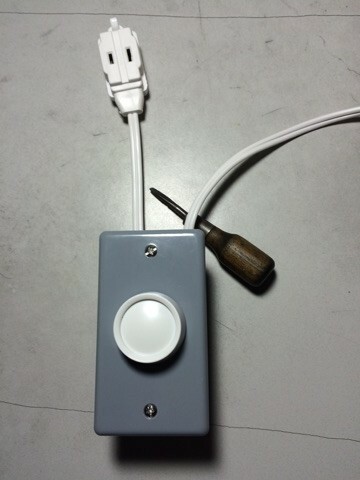 Inline lamp dimmer switch. $10. No assembly required. Can also be used in between a cheap t-stat and the heating appliance to ensure the appliance doesn't run unregulated if the t-stat fails. As an electrician I kinda cringe at tape around wire nuts, wire nuts should have spring pressure on the wires to hold them together, its not just a cap, it's bad practice to have tape around them. 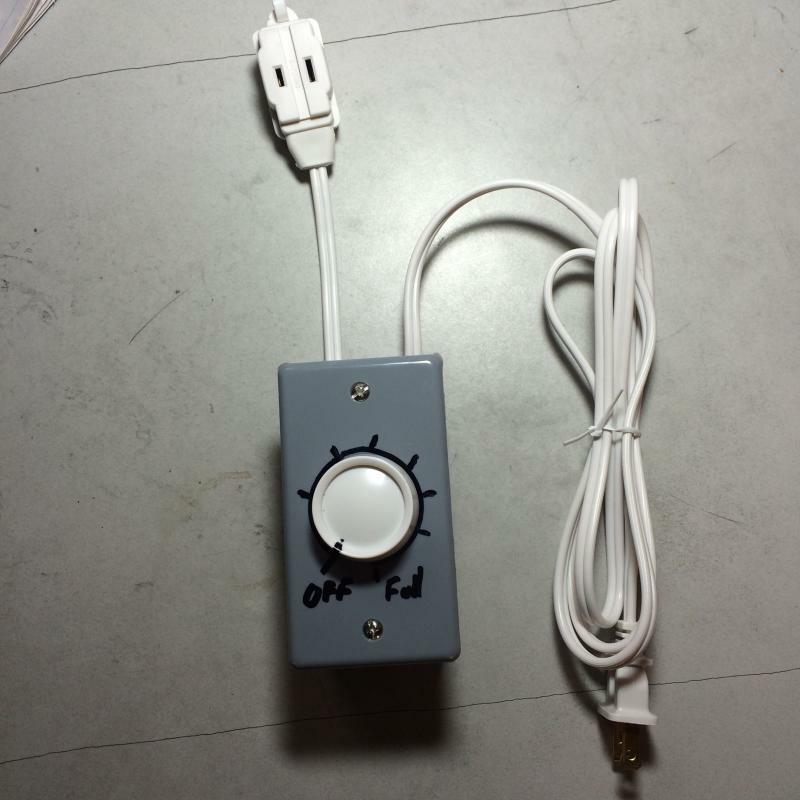 Also we tend to put switches and dimmers on the hot side (smooth side) as general practice, just so when the switch/dimmer is off, there is no potential at the device. Electrically however it doesn't matter. Besides that, very inexpensive but professional looking dimmer. Very nice sir. I was reading that most on/off t-stats will fail in the off position and that most proportional t-stats fail in the on position because of something to do with the coil. Being an electrician, do you know if this is true or just a myth? 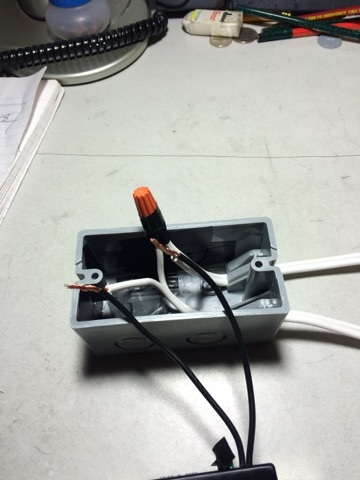 Electricians don't really deal with the inside of devices, we just install them and run power and controls to them. An electronics tech is who could answer the question. But what I have been told is that the solid state parts in some t-stats can short out, basically bypassing all power regulation. Some of the higher end proportional t-stats include a mechanical relay (they call them safety relays) that can drop the power out when it is getting too hot, or w/e situation they deem to indicate a problem. I do know most devices in general favor solid state parts over mechanical because they are smaller and cheaper generally, so with my limited knowledge, I think it would more depend on the situation on why it failed, more than the type of thermostat. Thanks for that info, I didn't know that tape around wire nuts was a no no. I've just always done it that way figuring it was more secure and harder to pull the nuts off the wire. It's good to know that the smooth side is hot, I've always wondered which was which and I never could find the answer. It would make more sense to regulate the hot side. 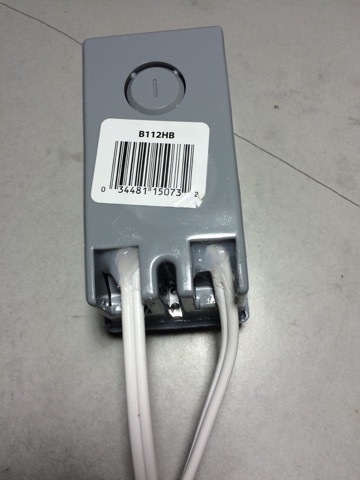 I was using in-line dimmer for UTH for a couple of months before investing in a nice VE-300. One suggestion I have for anyone using this (either slider or rotary) is to put down a piece of tape and marking for the dimmer setting. This way if you happen to accidentally move the slider, or want to change the setting based on recent temp reading you can see where it should be. Last edited by The Golem; 12-31-2014 at 09:23 AM. Good point, you need to know at a glace where the dial is set. I'll generally mark mine up with a sharpie showing the off position, the full on position and some marks around the outside for reference. Like this. Yeah I read they always identify the grounded side (neutral or white), because they really want to make sure you got your stuff straight with that. You really have to have quite the situation for it to matter, someone opening the box up while it is plugged into the wall and thinking it is off without checking... but if you can make it 1/2% safer by landing the wires different, why not. Plus if we are going to sticky this, might as well do it right. Wire nuts will have a spring inside of them, when it tightens down correctly there is actually spring pressure holding everything together. If the wire nut was not tighten down correctly and the tape is just holding the wire nut on, you could create a high resistance situation where it heats up and the wirenut melts and theres potential fire and just bad things happen. Best just to make sure the wire nut is on correctly and there shouldn't be any issues. It's almost better to have a wire nut fall off and device stops working and you know theres an issue or if it short outs, it just trips a breaker or blows a fuse, at least there won't be a fire, Given it is a rare situation, but as a electrician I have seen it quite a bit.